The founder of MOM's Organic Market and his family ate food that was past its labeled date for a year to make a point: Expiration dates are not representative of freshness or threat, and they contribute to Americans wasting billions of dollars of perfectly good food every year. See photos of some of the expired food consumed. 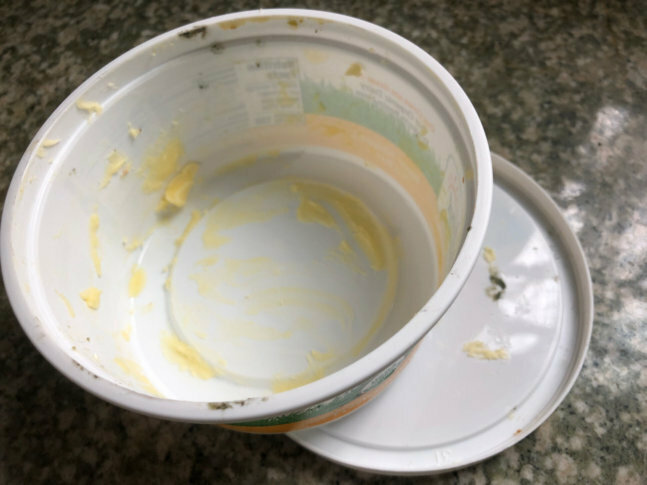 WASHINGTON — Scott Nash ate yogurt that was 180 days past its “best by” date, and he lived to tell about it. The founder of MOM’s Organic Market and his family ate food that was past its labeled date for a year — including dairy, produce, meats, fish and packaged food — to make a point. Expiration dates are random and not representative of freshness or threat, and they contribute to Americans wasting billions of dollars of perfectly good food every year. And they aren’t actually “expiration” dates at all, though that is how consumers perceive them. “Some stuff is damaged, and that’s legitimate, and some stuff really does go bad. But a lot, most of the food that gets discarded is due to these arbitrary and confusing dates,” Nash said. He calls it “consumer anxiety disorder” over food safety. “They are very vague. What does ‘expire’ mean? There is ‘best by,’ there is ‘sell by,’ ‘best if used by.’ I just think that there is no consistency, and that it is creating confusion,” Nash said. Labels like “sell by” and “use by” are quality dates only. Except for infant formula, dates on food products are actually not required by any federal law or regulation. Manufacturers and producers use them to indicate what they consider their best quality window. The Food and Drug Administration, which agrees expiration dates lead to unnecessary food waste, does say any food that is obviously spoiled — abnormally soft, discolored, moldy or has a strong unpleasant smell — should be discarded, no matter how properly or how short a time it has been stored. People do get ill from eating food that has gone bad, but your best judge is appearance, texture and smell, and in most cases, you’ll know. Andrea Goergen, a registered dietitian and nutritionist at MedStar Washington Hospital Center, agrees. “It is very important to make sure that you use your senses. If a product is technically good but looks, smells or tastes spoiled, err on the side of caution and throw it out or compost it,” she said. Nash used common sense, a nose and his eyes and ate things, just based on their age, that most wouldn’t even consider. Arbitrary labels not only lead to food waste, but also cost grocers money. And not just the big grocery chains. “I probably spend an hour a day checking dates,” said Karl Hirschhorn, who owns small neighborhood grocer Open Door Market on California Street in Northwest D.C.
“I won’t put out new eggs until we sell the other ones. Customers will keep pushing them to the back until the eggs crack,” he said. For Hirschhorn and other grocery retailers, some of it means a loss, but not always. Some products are guaranteed sales by vendors, like bread. The delivery driver decides how much bread to put on the shelves, and is usually responsible for rotating it out. The U.S. Department of Agriculture, Cornell University and the Food Marketing Institute have developed a guide to how long virtually every food will keep, whether in the pantry, refrigerator or freezer. The FoodKeeper is available both online and as a mobile app download. It is estimated that between 30 and 40 percent of food in the U.S. goes uneaten, meaning Americans discard $165 billion in food annually. Nash, who started the MOM’s Organic Market chain in Rockville more than 30 years ago, would like to see consumers pay less attention to dates and more attention to common sense, and to be conscious of needless food waste. “I do all the cooking for my family, and if you come to dinner at my house, I guarantee you’ll be eating at least one thing that is past its date,” he said. “Just my luck, 250-million-year-old salt and it expires next year,” Nash wrote on his blog.